LEICESTER, ENGLAND—In anticipation of the club’s first-ever top-flight league championship in its 132-year history, officials from the Leicestershire Police announced Monday that they have deployed additional forces in order to join in with Leicester City fans celebrating their Premier League title. “Given the massive turnout we are expecting, we have significantly increased our police presence so that we are able to really enjoy Leicester’s league championship together with all the fans,” said chief constable Simon Cole, adding that several additional units of officers, who will be outfitted with team scarves and replica jerseys, will be strategically positioned at various points throughout the city to spray beer bottles and sing team chants alongside thousands of Leicester City supporters. 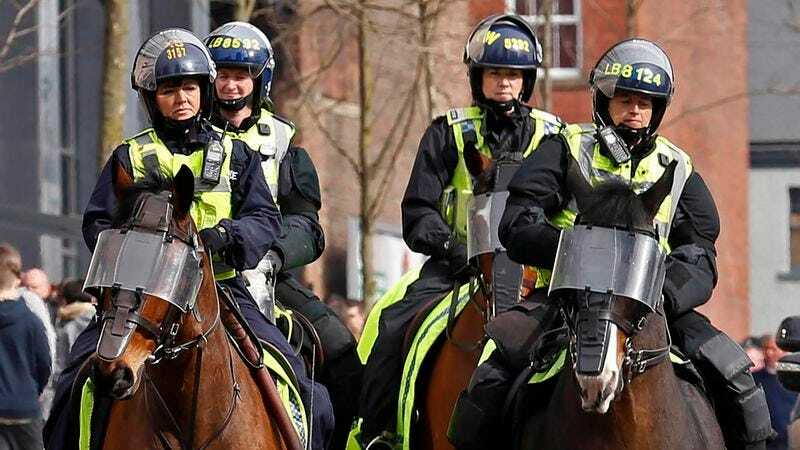 “We will also have horse-mounted patrols to lift up team banners, as well as officers driving police cars through the most congested streets while honking their horns and leaning out their windows screaming ‘Champions!’ If celebrations start to get out of hand, we will be right there to join in, climb up traffic lights, and go completely nuts. C’mon you Foxes!” At press time, numerous police units had rushed to the scene after several officers requested immediate backup to help turn over a parked car and jump on top of it.